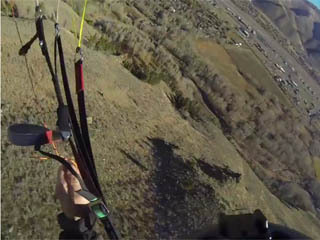 SWING has launched an addtional Speedriding/Speedflying product for 2013. The MIRAGE. Whilst the Spitfire is an all-rounder, that succeeded to gain almost a "cult status" in the scene, the MIRAGE is targeting the ambitious Speedrider that has the focus on maximum glide and dive range, safety and direct and precise Handling. It has more cells, higher aspect ratio an innovative riser/line setup and many more new details. All these features allow you to push your limits even further. What`s new on the Mirage? The Mirage is a new generation Speedflying wing, setting the future standard of Speedflying Technology. The Mirage is the first wing ever build with a 3 Line concept. There is not a single D-Line, which gives the Mirages the biggest range of glide and dive ever seen on a speedflying wing. An 8m2 Mirage gos as steep as a 8m² Spitfire but has a glide like an 11! Try it if you don' t believe it. This new concept together with a thinner profile, more aspect ratio and much more cells, result in the worlds most advanced speedflying wing ever built. The best is, it remains safe and is still easy to fly! Try it and like it! The MIRAGE is available in Sizes 8,5m², 9,5m², 11,5m² and 13,5m². Swing are also working on an 8m² version of the MIRAGE for experts and competition.